In order to obtain access to these databases : Fill in the Request form; after which you will receive further instructions how to download the data. Spatial layers on key soil properties for the topsoil and subsoil with pan-European coverage are derived from the spatial allocation of STUs. STUs are only allocated to 1km grid cells for those areas where suitable data exist to perform a multi-criteria evaluation and land allocation. In other areas the properties of the dominant STUs are mapped. The area where STUs are allocated is provided as a binary layer. The layers of soil properties of STUs are intended to facilitate modelling requirements by making the complete range of data for a soil mapping unit (SMU) available in a single layer. The procedure used to spatially allocate STU properties to 1km grid cells does not estimate the property of that grid cell, but is the likely distribution of all STUs of a soil mapping unit (SMU) within the spatial and thematic limits of that unit. Users should be aware that the correlation between the soil properties of a grid location with point data from ground surveys may be very low. The final result of the modelling activity should be aggregated to SMUs or another larger mapping unit. It is generally not recommended to aggregate soil properties to larger spatial units by averaging the property values first and then using the average values as input for models. The depth layer included in the data set is the "depth to obstacles to roots" derived from the ESDB depth classes recorded in the field [ROO.ST_SGDBE]. For organic soils in Sweden the field contains only code 4 (Obstacle to roots between 20 and 40 cm depth). The depth value for this class is set to 30cm. As a consequence, the subsoil layers for organi9c carbon and bulk density only contain mineral soils. The layer is not suitable to calculate soil organic carbon density other than the topsoil. To compute this parameter the required soil properties (depth, organic carbon content, bulk density and gravel content) should be available for the depth of the soil. The soil texture data contains texture values as provided by the Harmonized World Soil Database (HWSD) V.1.2.1. The HWSD provides texture values also for most typological units classified as peat. In the ESDB pedo-transfer rule (PTR) 22 is used to identify peat. The conditions defining the PTR are purely based on the soil classification name (taxonomy). Data of organic carbon content of the HWSD do not fully correspond to the results of using PTR 22. For example, Histo-Humic Gleysol (Ghh) is classified as peat by PTR 22, but classifying the soil texture and organic carbon content data of the HWSD does not necessarily provide the same class. 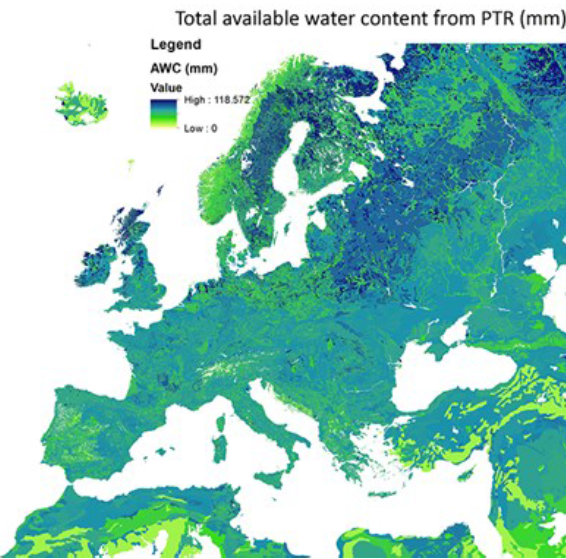 The data have been prepared for use by the Land Resource Management Unit (Institute for Environment & Sustainability) of the Joint Research Centre (JRC) of the European Commission. The data provided has been prepared for use by internal research activities in the Land Resource Management Unit of the Institute for Environment & Sustainability, JRC Ispra. The data were developed for research purposes of the JRC only and not for any other activity. The JRC does not accept any liability whatsoever for any error, missing data or omission in the data, or for any loss or damage arising from its use. The JRC agrees to provide the data free of charge but is not bound to justify the content and values contained in the databases.